Average Height	: 19" - 21"
Average Weight	: 45 - 52 lbs. Stabyhouns is a gundog and originated from as far back as 1800 in the North end of the Netherlands in an area called Friesland, a (which probably is a descendant of Spaniels brought to the Netherlands by the Spanish conquistadors). This breed has been well known and documented in the Netherlands from which they herald. The first part of the name is probably from the Dutch: sta me bij (stand by me). The last part is simply Friesian, meaning dog. It is pronounced "hoon." The ancestors can most likely be traced to the span joel (or spaniel), who had come during the Spanish occupation to the north. There is probably a strong relationship between the Staby, the Small Munsterlander, and the Drentsche Patrijshond. Staby were used for hunting moles, rats and skunks, as a watchdog and as a pest exterminator in the yard and around the house. They were also occasionally trained as a hunting dog for wild hare and upland birds. In the latter case, it was mainly a matter of hunting by poachers because the Staby was not a dog of the nobility, but the small farmer. Stabyhouns are a fine pointer, an excellent tracker and also a good watchdog. It was also used as a draught dog. The Stabyhoun was originally the dog of the "little guy", the day laborer farmers or small landholders. Today this very versatile dog is now mainly a companion dog. Stabys are independent. Some people call it cockiness, others call it stubbornness or obstinance. But, in fact, it is independence, and that is something that is deliberately bred. The farmers wanted a dog that could work independently. And that property Stabys have retained still today. In case of insufficient and / or inconsistant guidance, a Stabyhoun can develop into a difficult and unstable dog. With proper guidance, you will have in a Staby, an adorable dog and a great friend for life. Stabys are very inquisitive. A nice feature, but at the same time they can also get into trouble. Generally they expect the boss to offer a helping hand. So always pay attention to what a Stabyhoun is up to, because with their inquisitive nature they also can fairly quickly find themselves in a difficult position. Watchful and alert. Will bark to alert their owners ‘somethings up’ ~ therefore is considered to be a good watchdog. •	The Stabys are an alert, inquisitive, curious dog. A good watchdog. •	A gentle, loyal, loving dog. •	Like to work, have a job, keep busy. Self-motivated. •	Gentle, fair training is a must. Harsh treatment with this dog ~ they will shut down. •	Intelligent and quick to learn and please. •	Require plenty of exercise ~ lots of mental & physical exercises. •	Great dogs for hunting, scent training, agility, lure courses, etc. •	Will chase things smaller than them and dig. They were bred to be vermin hunters, so will kill rats/mice. •	Good with children if properly socialized with them and children treat them with love & respect. Devoted, soft and gentle as a pet, very intelligent, obedient, the Stabyhoun is a good guard dog, not vicious or snappy. It is highly trainable, but needs consistency. The Stabyhoun has a nice temperament, is friendly, tolerant and willing to please. A characteristic of the Stabyhoun is its great tolerance toward children. Animals that belong to the household are treated in a friendly way. This dog has a laid-back temperament and it loves to play with children. It makes a good watchdogs. It is very affectionate and many of these dogs love to "cuddle." Many Dutch owners use its natural retrieving abilities for playing with balls, because it will go into the water and find the balls and then bring them back. This dog is a wonderful pet to have around the house and is just perfect for life in Holland with its many waterways and parks. While it makes a good watchdog, it is friendly and amiable. It is also a very powerful dog and larger ones can pull sleds in the winter. By its nature, the Stabyhoun is an obedient, peaceful, kind and patient dog that is deeply fond of its family, and it likes to please its owner. Social and quiet, friendly. Socialize well to prevent your Stabyhoun from becoming reserved with strangers. The Stabyhoun is utmost a wonderful family and companion dog. This breed likes to have a job to do, because of its great intelligence, speed, flexibility and eagerness to please, it is ideally suited as an agility dog (one owner prefers her Stabyhoun over her Champion Agility Sheltie! ); they do Flyball, they love to retrieve tennis balls, they show off at obedience class, etc. These dogs are keen and active dogs outside, but calm dogs inside of the house, as long as they get a moderate amount of daily exercise. The origin of the breed is in hunting, and while they are still used for that purpose, they are nowadays foremost used as family companions. Those who have hunted with the breed have stated, "The Stabyhoun can be taken out in the field for hours. It will wait steadily and calmly for the shot. 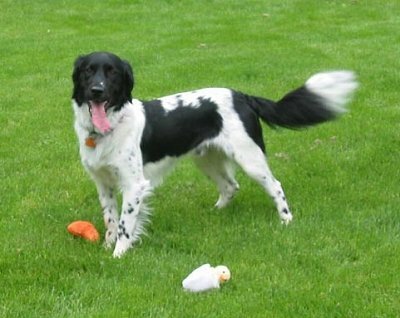 The Stabyhoun is both a soft-mouthed retriever and a pointer that is particularly useful for hunting ducks. It is a fine retriever, and water work is one of its strongest sides. It marks well and is easily controlled over greater distances and is an eager searcher. It brings in any game alive and undamaged. When catching moles and other vermin these animals are killed through breaking the neck, but the furs remain undamaged. It is an excellent swimmer that can handle cold water and loves to please its owner." Today the Stabyhoun is ultimately a wonderful companion and family dog, but it also enjoys a moderate, though very devoted fancy among Dutch sportsmen. Its numbers are increasing slowly but steadily. Since the dog used to be owned by farmers who were generally poor, it was very welcome to have such an all-rounder, because often only one dog could be afforded. The dog had to be tolerant toward the other livestock on the farm, friendly with the children and protective about the premises, without being vicious or snappy. Be sure you are this dog's firm, confident, consistent pack leader to prevent it from becoming stubborn and willful.